A sweeping history of jazz from its roots in African and Blues music to the present day, Voices and Freedoms presents ways to understand and appreciate jazz’s major stars and its musical evolution more deeply. The book was made into a nationally syndicated 16-part radio series of the same name. ♦ Hear a sample from the radio series based on the book. It’s from Show #14, on Ornette Coleman. And go to the RADIO SHOWS main page to see the complete list of Voices and Freedoms episodes, a list which mirrors the Table of Contents of the book. This was Dr. Richard Guzman’s first book. The 16-part radio series of the same name ran for many years across the nation, and is still considered one of the deepest explorations of jazz ever to play on radio. Soon an updated pdf and e-book version will be available. Those who buy the book in either form can register to hear the 16-part radio series. The book and radio series follow jazz history by focusing on voices—a bedrock quality of jazz that doesn’t change—and freedoms, issues in musical form, which do. It sees jazz history as part of a larger panorama of American history where voices and freedoms continually play out not just in music, but in the areas of race, Civil Rights, and equality. ♦ Return to the BOOKS page of this site. 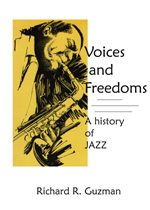 This entry was posted in Jazz History, Music & Meaning and tagged African music, blues music, Jazz History, jazz improvisation, jazz music, jazz musicians, jazz tone, Richard R. Guzman, Voices and Freedoms: A History of Jazz. Bookmark the permalink.